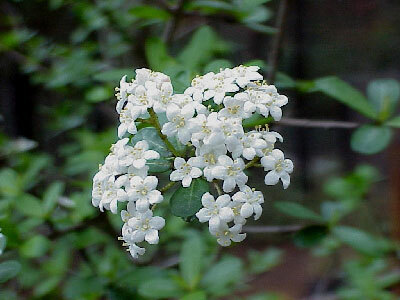 Walter's viburnum, Viburnum obovatum, is a native shrub or small tree, in the Caprifoliaceae or honeysuckle family. It can be found growing in moist pine flatwoods, stream and river banks, swamps, hammocks, and also in much drier uplands. It has a colonial habit and will produce suckers. It typically has a densely branched habit, but specimens grown in shade will be slightly more lanky. Branches produce many small, stiff, branchlets. Mature plants can reach a height of 20 to 30 feet. The leaves are opposite, simple, 3/4 to 2 inches in length, and obovate in shape (narrower at base than tip). Leaf margins are entire except for occasionally scalloping at the tips. The lower leaf surface has small brown glandular dots. It is tardily deciduous losing leaves as new ones emerge. The leaves look much like yaupon holly, Ilex vomitoria, however the holly's leaves are alternate. Viburnum obovatum is the earliest blooming viburnum with numerous flat topped clusters of white flowers appearing in late winter to early spring. It may also produce sporadic blooms in mid to late summer. The very small individual flowers have five petals and are an important nectar source for many insects. Red when immature, the fruit turns black at maturity. It is a flattened drupe that is oval to elliptic in shape with a single seed. The fruit is a food source for wild turkey, songbirds, and small mammals. Viburnum obovatum can provide ornamental beauty to the home landscape as well as food and shelter for wildlife. It is an excellent candidate for use as a hedge because of its dense foliage and thicket forming habit, and can be pruned to maintain a desired shape or left to grow naturally. The dense foliage provides excellent nesting habitat for songbirds. It will produce the most dense foliage and flowers if planted in partial sun, but will also tolerate much shadier areas. It is extremely adaptable to a variety of conditions and can be grown in wet to dry conditions with sandy to organic soils. Once established it can actually be drought tolerant. Propagation can be most easily achieved by stem or root cuttings. The best time for cuttings is March through June. Propagation can also be achieved by seed, sown immediately after collection, but cuttings are much easier and faster.